Humans is a British sci fi series based on the Swedish show Real Humans. It aired on Channel 4 in June and ABC2 in Australia in September 2015. The show explores ideas about artificial intelligence and the lines between human and machine, with a mixture of both human and "synth" characters. If you have seen the show, what do you think of it? If you've seen Real Humans how do you think the two compare? 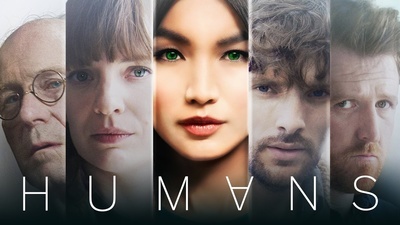 Humans poster, Channel 4 via Google. Fair Use. I loved it however not as much as the original one which was sub titles and was from Sweden.....originals are usually the best. However I did watch this one also. I saw all the trailers to this. I was intrigued by the concept, but never ended up watching. I was surprised that my mum actually got into it as it is not usually the type of show she goes for. My partner and I were just talking about this yesterday and saying that we would really like to see it. We haven't had a chance yet. I've only seen a little bit of the Swedish one so I can't really compare. I really like the English version. It seems to be mostly about what it means to be a family. I enjoyed most episodes but find the last episode u satisfying. The plot seemed contrived or too neatly orchestrated or something. I felt myself able to enter the world of synths and the family and "believe" the reality early on, but I found the resolutions a little unbelievable. Enjoyed it all the same. Unfortunately, I haven’t heard of this show. I enjoyed it. I saw some of the original Swedish one, but I think the British one has more pace. It does look at family relationships and relating to human-like machines, but is also about accepting people who are different and the fear of others which relates to the present refugee situation.. I cant say that I have a watched an entire season, but I did like what I saw of it. Best book shop in Brisbane?